Welcome to Samplitude Music Studio! This video will provide you with an easy introduction to the world of digital music production and get you familiar with the start dialog options. In this video we'll show you everything you need to know about recording an external source. In this video, we'll show you all of the most important options for editing audio objects in Samplitude Music Studio. With the mixer, you have control over all your projects. Volume, panorama and effects offer everything you need to get the best out of your instruments, sounds, and vocals. So you can mix your songs just like a professional sound engineer. After you've finished mixing your tracks, the next step is mastering. In this introductory video we'll show you the Mastering Suite in Samplitude Music Studio. 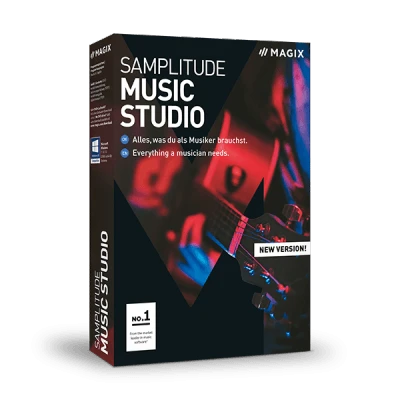 You can export your finished songs from Samplitude Music Studio in various formats, for instance as a CD or audio file on your computer. Control a recording in Samplitude Music Studio using your smartphone or tablet. Download the free MAGIX Audio Remote app and connect with the program on your PC via WiFi. This turns your smartphone into an integral tool for music making. The included virtual instruments offer unlimited variety: From strumming and wind instruments, guitars and basses, to percussion and drums. Just connect the MIDI keyboard to play live or use the MIDI objects to program them. The track editor gives you access to all the most important track functions: From Audio and AUX settings to plug-ins, mixer settings, comments and equalizer. You can correct recordings made with the MIDI keyboard or drum pads, or you can make your own patterns with your mouse. Automations allow you to make your recordings more dynamic. Volume, panorama progressions and effects are controlled with the help of track curves. Put your vocals in the right mood. Or use the harmonizer to create a chorus which is automatically adjusted to fit the selected key. Vandal SE provides you with a top class virtual guitar and bass amp. Vandal SE virtualizes every aspect of a real amp. From the type of tube to the amplification stage on through to the speaker coil, this virtual amplifier is as good as the real deal and has an unbelievably realistic sound. The BeatBox2 drum machine is the perfect tool for making grooves and beats. In addition to an amazing sound engine and lots of drum kits, BeatBox 2 offers complete control over engaging sound progressions and an integrated effects sections.